It might make sense for you to combine all your old pensions into one place. In 2015 the Association of Accounting Technicians commissioned research into working life in the UK. Apparently, the ‘average’ person will consume 29,328 cups of tea over this 47 period – thirsty work! They also found at that on average we work for six different companies on our ‘journey to job satisfaction’. If this sounds like you, when it comes to planning for your retirement, you’ll likely have a lot of financial baggage. It’s hard to get a clear picture of where we are at if we have lots of pension pots. If you’ve changed job quite frequently some of these might not be worth much. However others might be worth quite a bit more than you remember. In order to have the flexibility to choose what retirement looks like, we need to know what we have got now. It’s quite possible to gather statements together and look that way. But it’s hard to keep up to date, takes a lot of time and you can’t always get the information you need quickly when you want it. You might be paying over the odds, or invested in a poorly performing fund. Even if you do identify the latter you might be stuck with alternatives that are even worse. Over the last few years the government has talked about a Pension Dashboard. This would make it easier to see what you have got. However this hasn’t really progressed far. If, and when, it does arrive it is unlikely to explain what charges you are paying and what your investment options are. It definitely won’t be able to tell you what is best for you to do. This makes it more straightforward to see what you’ve got and how it’s performing. A lot easier to keep your investment strategy on track and modern pensions often provide a wider range of investment choices. When you come to retirement it’s also a lot simpler coordinating one arrangement. In some cases you have a better range of options built into the new plan. Everyone’s situation is different. Some older pensions include guarantees or better than normal benefits. It pays to have a professional review your retirement arrangements and provide their recommendations. Your pension isn’t the only part of your financial life and they will help you take everything into account. The best thing for you might be to use your other assets to provide for yourself when you stop working. Changes to pensions in recent years mean that it can be more attractive to leave your pensions alone for as long as possible. If you do bring your pensions together into one place it is important that the money works for you. It needs to be invested well and the investments need to be within your financial comfort zone. A financial adviser will be able to help you balance your willingness to take risk, need to take risk, and capacity to deal with potential market falls. Having a professional manage your money on your behalf is no longer the preserve of the financial elite. Regardless of the value of your portfolio you can access the expertise of our investment management team. They research markets, investment opportunities, and manage portfolios for our clients based on an agreed level of investment risk. When you consider the fact that there are around £3 billion pounds remaining in unclaimed pensions, it might be a good idea to look through your old paperwork. That figure is expected to increase significantly with the introduction of auto-enrolment. Moving job or home means many people lose track of their old pensions. The Government’s Pension Tracing Service may be able to help. If a career worth of pensions has made it impossible to understand whether you are set for retirement. Or you don’t know if your money is working as hard as it should. 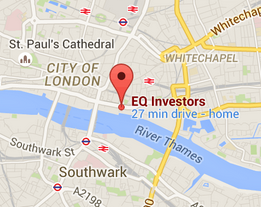 You can contact EQ Investors and speak to one of our advisers. Click here to request a call back. A Technical Consultant at EQ Investors since August 2010, Dan’s Music Technology degree helps him approach Financial Planning problems creatively. Dan is both Chartered Financial Planner and a Fellow of the Personal Finance Society (PFS). Dan works with the Chartered Institute of Securities & Investment (CISI) and the PFS to help develop their support for Paraplanners. Dan is an Accredited Paraplanner™ with CISI and won the 2014 IFP Paraplanner of the Year award. Dan is also involved in youth work at his local Church in Hatfield.